VJ Books Presents Author Andrew Grant! Andrew Grant was born in Birmingham, England in 1968. He graduated from the University of Sheffield with a degree in English Literature and Drama, and then founded his own theater company. The company produced original works and was critically well-received, performing at the Edinburgh Fringe Festival, among other places, but was sadly less successful financially. After that venture, Grant began working in telecommunications to make ends meet. He worked in the field for fifteen years, but much of his career falls under the Official Secrets Act. 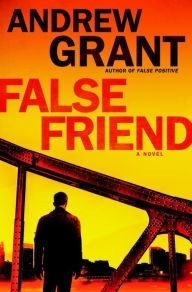 When, at long last, Grant left telecommunications, he took to novel-writing, and hasn't looked back since. He is best known for his books about British Royal Navy-trained agent David Trevellyan. Andrew is married to American novelist Tasha Alexander, and currently lives near Laramie, Wyoming. Novelist Jim Grant, better known as Lee Child, is his brother. Author Signed Hardcover Book. May 2010 NY: St. Martin's Press First edition, first printing, mint, new/unread in a flawless dust jacket, signed by the author. Each dust jacket is protected in an acid-free archival quality acetate cover. Author Signed Hardcover Book. May 2009 NY: St. Martin's Press First edition, first printing, mint, new/unread in a flawless dust jacket, signed by the author. Each dust jacket is protected in an acid-free archival quality acetate cover. Author Signed Hardcover Book May 2009 NY: St. Martin's Press First edition, first printing, fine in a fine dust jacket,signed by the author, remainder marked. Each dust jacket is protected in an acid-free archival quality acetate cover. Author Signed Hardcover Book. January 2017 NY: Random House First edition, first printing, mint, new/unread in a flawless dust jacket, signed by the author. Each dust jacket is protected in an acid-free archival quality acetate cover. Author Signed Hardcover Book. December 2015 NY: Random House First edition, first printing, mint, new/unread in a flawless dust jacket, signed by the author. Each dust jacket is protected in an acid-free archival quality acetate cover. Author Signed Hardcover Book. December 2015 NY: Random House First edition, first printing, fine in a fine dust jacket, signed by the author, remainder marked. Each dust jacket is protected in an acid-free archival quality acetate cover. Author Signed Hardcover Book. January 2018 NY: Ballantine Books First edition, first printing, mint, new/unread in a flawless dust jacket, signed by the author. Each dust jacket is protected in an acid-free archival quality acetate cover. Author Signed Hardcover Book. January 2019 NY: Ballatine Books First edition, first printing, mint, new/unread in a flawless dust jacket, signed by the author. Each dust jacket is protected in an acid-free archival quality acetate cover. Author Signed Hardcover Book. October 2014 NY: Random House First edition, first printing, mint, new/unread in a flawless dust jacket, signed by the author. Each dust jacket is protected in an acid-free archival quality acetate cover. Author Signed Hardcover Book. October 2014 NY: Random House First edition, first printing, fine in a fine dust jacket, signed by the author, remainder marked. Each dust jacket is protected in an acid-free archival quality acetate cover.